The date for the 4th edition of the AFECA Asia MICE Youth Challenge 2018 is finally confirmed, and we are very excited to announce that it will be happening on 24th October 2018, Wednesday in Goyang City, Korea alongside the upcoming AFECA AGM. Once again, on behalf of AFECA and the Organising Committee, we cordially extend an invitation to your Association to participate in this annual event. You are encouraged to select your best team (up to a maximum of three teams) from your country / area educational institutions to participate in this exciting Youth Challenge event again! 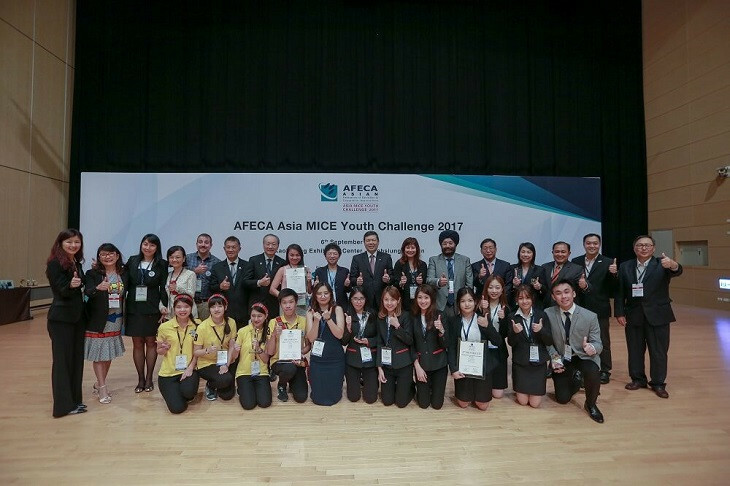 As with the previous two events, the last AFECA Asia MICE Youth Challenge 2017 had received positive and proactive responses across Asia. A total of 12 teams from 7 AFECA member countries / areas were at last year’s competition. All the participants had expressed that the competition was a very fulfilling and rewarding experience. It was an excellent and unique opportunity for the participants to connect with many peers from other participating countries / areas to inspire ideas. As such, we are very excited to organize the 4th AFECA Asia MICE Youth Challenge which will be open to all students attending an accredited university or college within Asia. It is a platform for the future Asian MICE talents to outwit other participants by showcasing their genius novel event and convince the judges why their country/area is THE BEST MICE destination in Asia! We are expecting more schools/countries participating this year as we have already received overwhelming interest from various countries / areas, especially those who had participated in our previous events with fulfilling experience. Organize your team today and take this golden opportunity to connect with the Asian MICE industry! Only registrations made through the respective AFECA Association Member country / area will be accepted. Thank you for your continued support to AFECA.